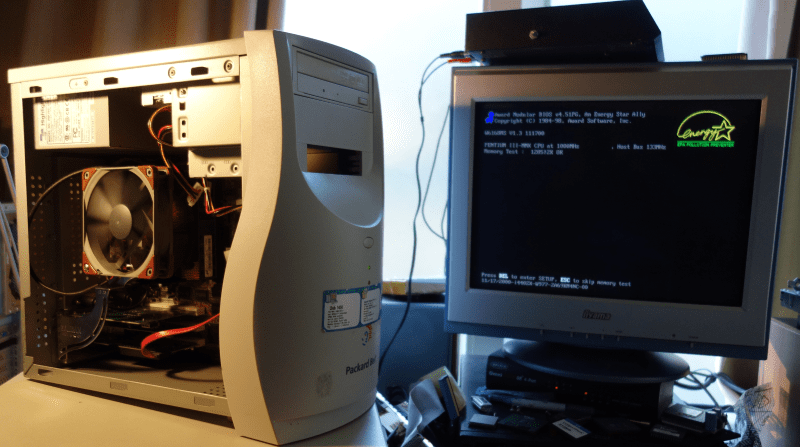 Back around the turn of the millennium I was a student with a part-time job at the UK/IE tech support for Packard Bell, working from a location in a small town in the east of the Netherlands. The work was typical helpdesk, the pay peanuts and the management significantly worse than in other similar gigs, but hours were flexible and it helped pay the bills and even with the downsides beat flipping burgers or piling boxes in a warehouse. 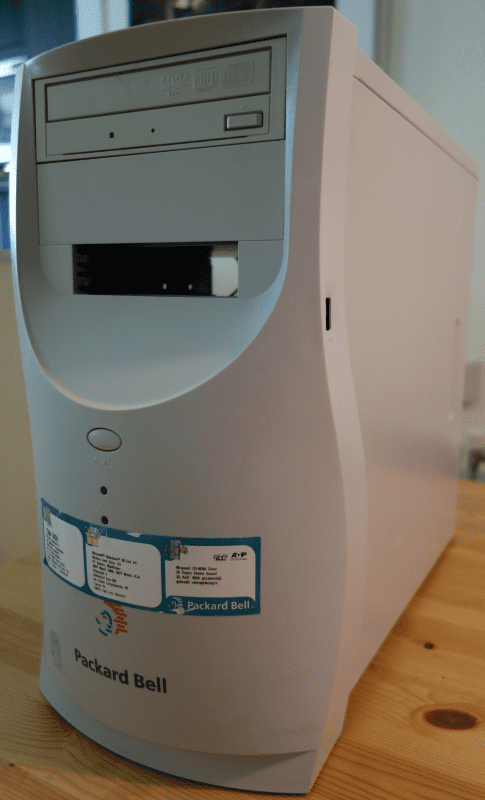 Packard Bell computers are and were aimed at the least knowledgeable end of the market, but at times the hardware could be quite good if somewhat eccentric. At the time I was working there they were just transitioning from late 90s systems with onboard VGA to early 00s systems with integrated VGA and consensus was that particularly in the low end it was a massive step backwards in performance and user experience. 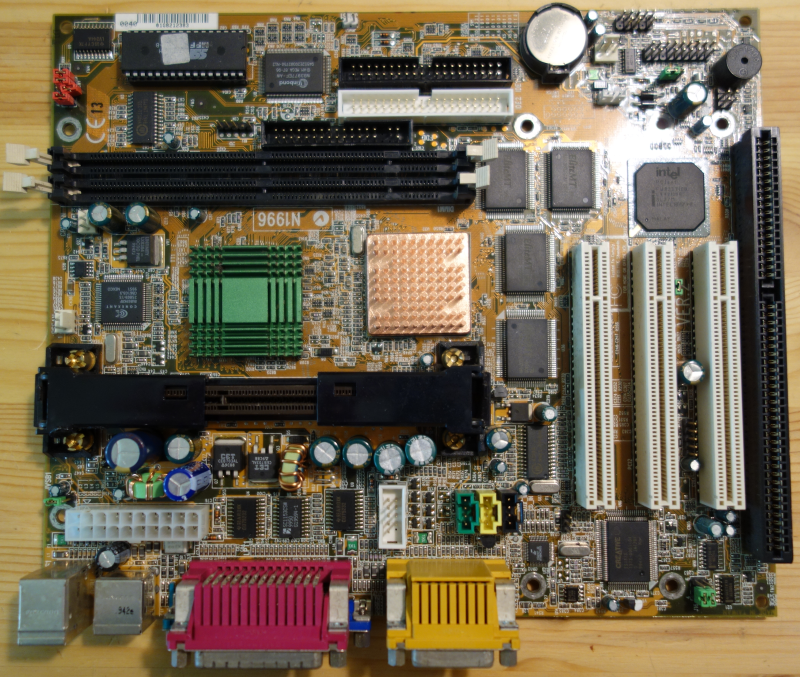 The last, greatest board with onboard VGA was the 1999 vintage MSI MS-6168 rev 2.0, internally called "Bora Pro" at PB. 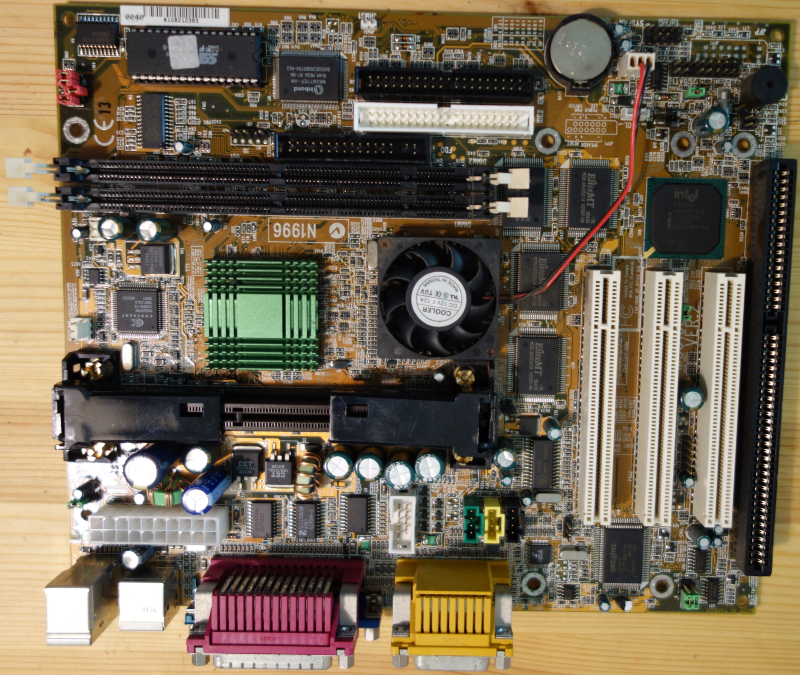 It wasn't a low-end board, with i440BX chipset, Slot 1, CuMine and 512MB RAM support - and a Voodoo3-2000 onboard. 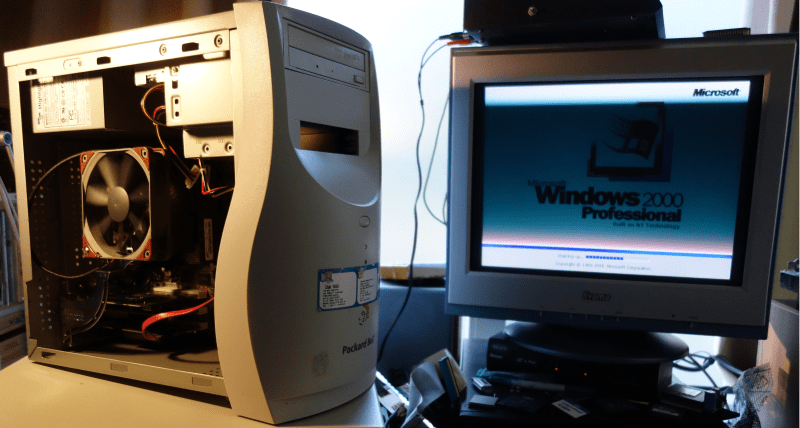 The V3 was slightly hobbled with only 8MB of RAM, but apart from that it ran at the regular 143MHz. This was a great little board to have in 1999/2000. And of course back then on a part-time helpdesk salary spent mainly on beer and travel I couldn't remotely afford it. Additionally one of my colleagues, friends and co-author of various community FAQs on CPUs, motherboards and memory, once tricked me into believing there was a special "BoraPro 2" with onboard Voodoo3 *and* an AGP slot. Unless the V3 was hooked up to the PCI bus (which actually would have made sense...) this is of course technically impossible. But I fell for it and he kept teasing me about it for years. So this board very much remained in my mind. Fast forward to this year. After a decade without vintage computers, my son lit my spark again and I started to think of what I wanted. Aside from an 'educational' SS7 system to build with my son, part of me wanted to do stuff with old sound cards (and indeed I have), but part of me wanted to get hold of an MS-6168 and do the board justice. So I did. And this system is the result. - Do all of the above and also make it as near to completely silent as possible. I'm by no means done with this system, but I've now met all of these aims, so it's worth a little topic. The MSI MS-6168 came in two revisions, v1 and v2; v1 had i440ZX chipset (so max 128MB per DIMM, 256MB total) and no CuMine support. v2 had i440BX and CuMine support. I believe that v2 was far more widely sold than v1, and looking at what I could find second hand that seems to be the case. I got one v2 for a low price (EUR 20) sold as dead, with a sticker saying "doesn't boot" on the back. Another one I got almost for free in a large lot I paid peanuts for. Both were indeed dead at first test, but the cause was clear enough: bad caps. The two big caps next to the socket were bulging and failing on both boards. After replacing them, both boards were rock-solid. I got two as I intended to push the board to the limit and wanted a backup. Unfortunately, the second board singularly refuses to boot with CuMine CPU, despite being exact same revision with exact same chips and VRMs as the first. Oh well, one down, but one very much remaining. Both boards had PB's OEM AMI BIOS, but MSI's own retail Award BIOS is also available. I have no huge preference for Award vs AMI, but as I want to push the system to its limits I upgraded to the retail BIOS to get clock and timing settings. All ready for mounting. But where to mount it...? The Squarius II is the one on the right. That's not yellowing due to age & UV, that's almost two decades' worth of cigarette tar and nicotine stains. "Filthy" doesn't even begin to describe the state of these systems. I immediately trashed the monitor, the other two cases (after rescuing one of the motherboards and a few other bits and pieces) and the PSU and heatsinks of the PB system. Then the cleaning began. Various chemicals combined with scrubbing failed to work, either leaving smell or stains or both (or in the case of very concentrated ammonia actually eating into the paint - but still leaving the smell). Eventually I decided to try one last thing before giving up - chucking all the metal and plastic bits in the dishwasher. To my surprise, it worked very well. The first time got rid of all the stains, a second run killed the smells - and it didn't touch the plastic and only caused very superficial oxidation to the steel parts. Then I dug up a new PSU (250W FSP with most of that on 5V - nothing special) and did my first silencing intervention. 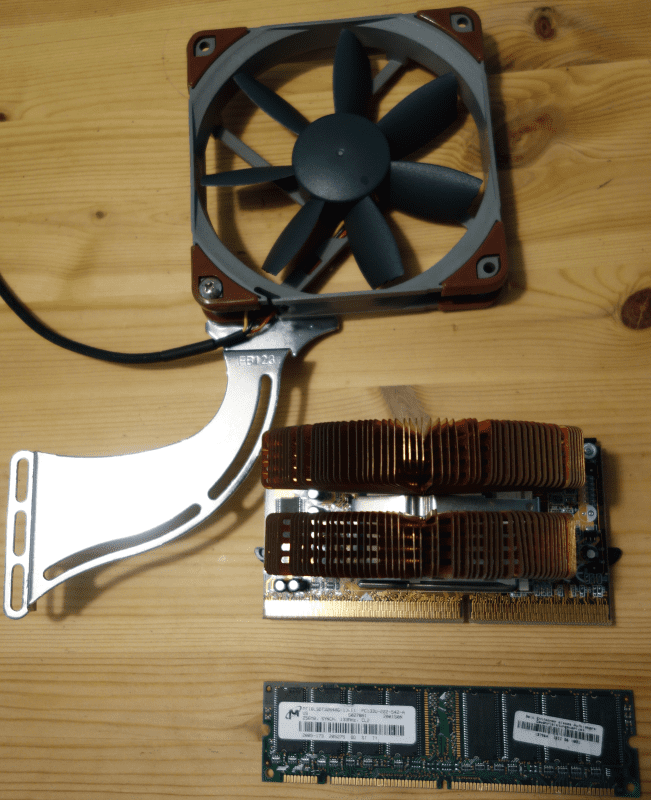 First I auditioned three low-noise 80mm fans (Noctua ULN, Noctua Redux and Coolink Swif2-800). It was a toss-up between the Noctua Redux and the Coolink in terms of noise at default 12V (with the more expensive ULN surprisingly making a more noticable, higher pitch sound than the other two), but the Noctua Redux moved more air, so I installed that in the PSU. Then the other components. Without modifications, CuMine is the max for this system, so here's a P3-1000EB on an MSI MS-6905 Master slocket. 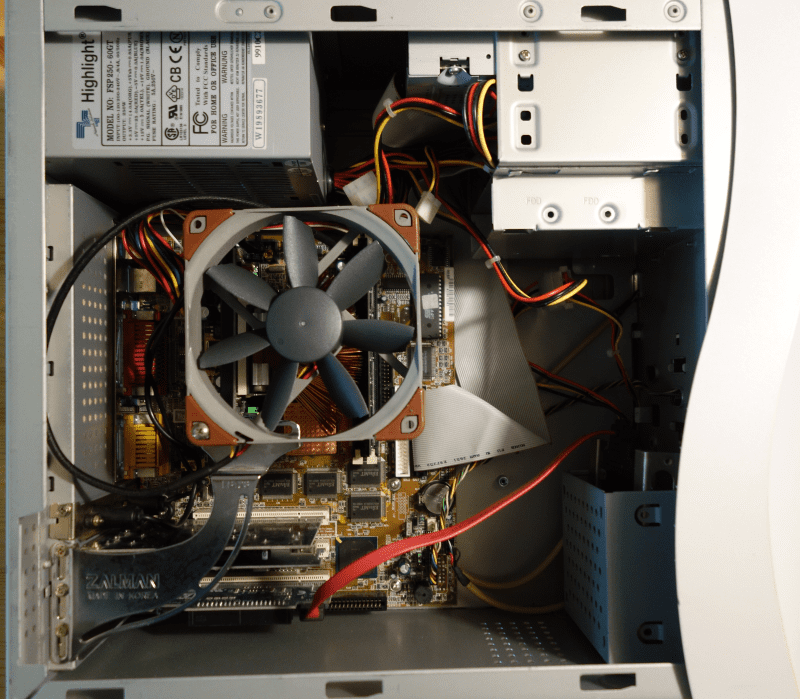 To keep it virtually silent, I added a Zalman CNPS-6000Cu heatsink with Zalman bracket to position a big, quiet fan immediately over the CPU. It was originally supplied with a Zalman 80mm fan, but to cool the Voodoo and the VRMs immediately behind the CPU I needed a bigger fan, so replaced the Zalman with a 120mm Noctua Redux. A Micron 256MB CL2 PC133 SDR-SDRAM DIMM takes care of memory. I'd install two, but the CNPS-6000 is so large it blocks the first DIMM slot. Next up - storage. These systems were orignally shipped with around 20GB of 5400rpm sloth. Unlike with the CPU there's nothing stopping you from adding the latest greatest SSD. Instead of going for a nonsensical waste of money and performance, I decided to choose the first SSD I lusted after but couldn't even remotely afford at the time, the Intel X25E in all its SLC glory, more specifically the 64GB version, which never sold for less than EUR 500 when new. Fortunately, the better part of a decade later it's pretty much being dumped. So despite it still being the single most expensive component of this system, at EUR 30 it didn't break the bank. Finally the rest of the I/O. The board only supports three USB 1.1 ports, which is rather limited - and they are sloooow. 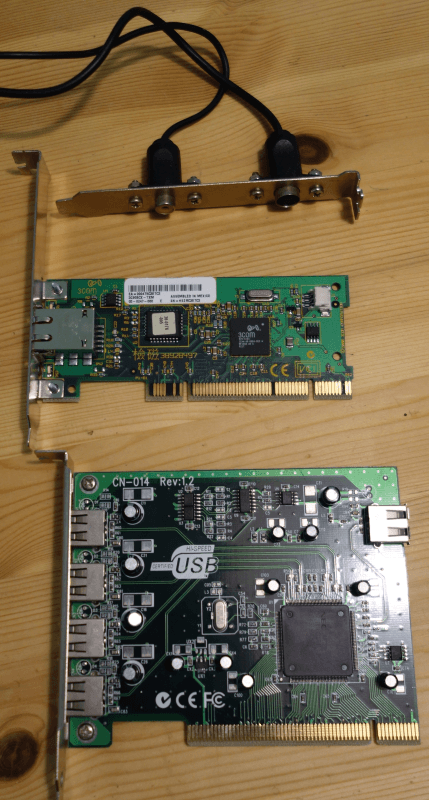 So I added a NEC USB 2.0 card. And any system here needs to be networked, so a 3Com 905C-TXM completes the part list. I also installed the TV-out bracket for the onboard Voodoo, although I seriously doubt I will ever use low-quality analogue video again. Taking pictures of a CRT is always tricky, but this looked fine IRL. The CPU and Voodoo heat sinks are warm, but not hot to the touch, although neither has been competely stressed yet. Basically, this system is go! - Sort out an issue with the power button - it seems to pretty randomly short, either booting the system when it shouldn't or shutting it down when running. It really is the button itself, as no problems with another one or a screwdriver on the pins. 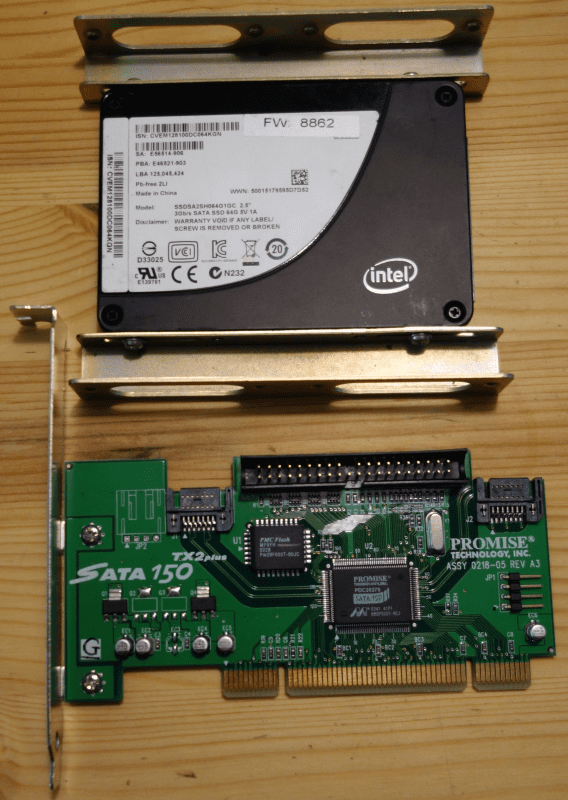 - Replace the SATA-150 TX2Plus with a SATA-300 TX2Plus. Theoretically it removes a bottleneck between SSD and CPU, but 150MBps is already over the max 133MBps of the 32b PCI bus, so apart from bragging rights this probably won't actually change much. I should get the SATA-300 TX2Plus later this week. - Do a pin mod on the CPU or mod the socket on a second MS-6905 Master slocket to see if I can get a Tualatin to run on this board. I have both P3-1400S and Celeron 1400A, so if I can get any Tualatin to run, I can hit 1400MHz, even if I can't manage 133MHz FSB with it. - Check temps of CPU and V3 on a hot day under heavy load (UT99 sounds like the ideal application) and see if cooling is adequate. If the CPU stays more than cool enough (as I expect) I might saw off the last cm of the heatsink fins, allowing me to add a second 256MB DIMM. - Check how hot the MOSFETs of the VRM are getting, and if in doubt, adding a little heatsink there. 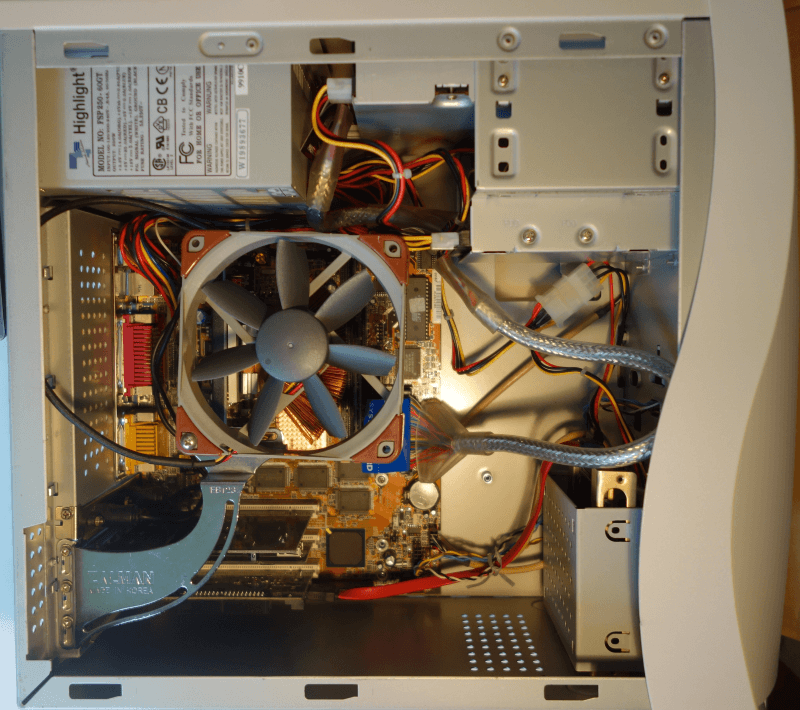 - Do some cable management, possibly with a rounded PATA cable for the optical drive. - Decide what to put in the 3.5" external slot. FDD would be most period correct (and I have enough lying around), but I have a pathological hatred of floppies (and a similarly low opinon of ZIP and LS-120 drivers for that matter). Probably will stick in a floppy just for looks, but not bother to hook it up. - If I find a second (i.e. spare) case, get creative with it. One idea is to carefully remove the red/blue PB logo, replace with clear plastic and illuminate with red/blue LEDs. If internal temps are too high, I might add an outtake fan and/or put a hole in the side cover above the 120mm fan, so it can draw in cool outside air. 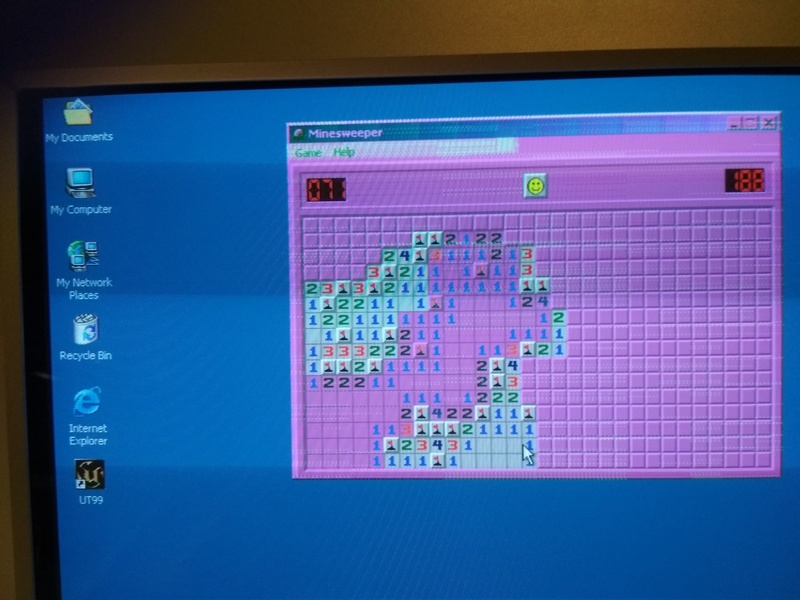 dionb wrote: Additionally one of my colleagues, friends and co-author of various community FAQs on CPUs, motherboards and memory, once tricked me into believing there was a special "BoraPro 2" with onboard Voodoo3 *and* an AGP slot. Unless the V3 was hooked up to the PCI bus (which actually would have made sense...) this is of course technically impossible. But I fell for it and he kept teasing me about it for years. So this board very much remained in my mind. Not quite. Those are chipsets with integrated graphics, not discrete onboard chips. Essentially an onboard chip is electrically identical to a chip on a card in an AGP slot - and as AGP is only a port, not a bus, you can't have two. The integrated chipsets you mention just integrate a switch to disable the integrated core as soon as anything gets plugged into the AGP slot. Note that that switch costs silicon, as do the paths and pins to actually hook up an external AGP - so quite a few low-end chipsets don't have either. 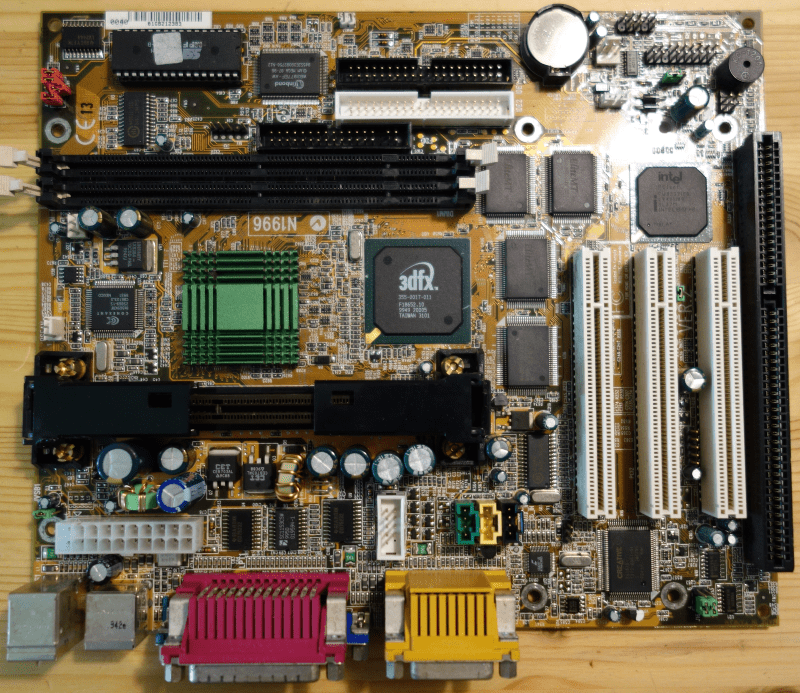 The cost-cutting wasn't in the board manufacturers leaving off the slot, but in choosing a chipset without the pins for the slot in the first place. Intel in particular frequently had near-identical chipsets differing only in that switch and the pins - take i810, which could never be fitted with AGP vs i815, and i845G with external AGP and i845GV without it. That was actually an interesting read, thanks! How does the V3 heatsink handle games in terms of temps? Revolter wrote: That was actually an interesting read, thanks! Maybe this evening I'll see if I can dig up UT99. Don't have a proper heat sensor either (to-do!) but not crashing and/or causing 3rd degree burns to my finger should be good news. Hmmph... not that rock-solid at 133MHz FSB after all. BSODs during unZIPping stuff are a sign of an unhappy computer. Clocking it down to 100MHz FSB got rid of those. Have now installed UT99 and it looks nice and crisp with GLide drivers. The heatsink feels slightly hot to the touch (~50C at a guess) but not excessively so. After half an hour I had an incident where the screen froze and keyboard input was ignored, but the game (or at least its sounds) seemed to run on regardless. As it was past midnight, no time to look into what happened there today. Maybe tomorrow. It's only 120mm, it just looks so huge because this is a small case. Have done a bit more playing on the system. There's a stability problem in UT, and it's oddly reproducible. If you start a practice session, video and input freezes, but sound & game continue after a few minutes into the second map - regardless of how long the first practice map took. So it doesn't sound like a temperature thing as that would strike after a certain amount of stress regardless of which map is running. To check I installed a second GLide game, GTA2. Not quite as demanding as UT, but if the V3 was getting too hot it would fail here too sooner or later. After an hour no issues whatsoever, so for now I'm considering the UT issue to be a software thing. I'll dig around my old software library though for another GLide FPS to double-check. Always nice to have a system with a bit of history. BX motherboard with onboard Voodoo is pretty cool as well. Even the onboard ES 1373 isn't a terrible sound card. For the 3.5 slot always the option of a gotek, floppy without the unreliable disks. Or as your interested in pushing it a 3.5 fan controller with temperature readouts? Quick google I found this which is available in aluminium which isn't perfect but matches a beige case better then black. Maybe someone makes white fan controllers, this was just quick search. chinny22 wrote: Always nice to have a system with a bit of history. I'm not using this system for DOS, but it's good to know I could if I wanted to, the ES1373 is good for that too. Thing is I'd rather keep the front original. I could make a fan controller by taking a blank 3.5" cover, drilling holes in and putting the potmeters in there, but it would ruin the aesthetics. If I happen to find an LS-120 that would fit the philosophy of the system, but for now I'll just do a beige FDD, but just for looks. Given that this beast happily boots from CD, and I have a stable OS install on SSD anyway, the added value of the Gotek would be minimal. I'll save mine for messing around with 486 systems that can only boot from FDD or HDD. I was given one of these and unfortunately in my stupidity (I was young at the time and in need of a faster machine) it got split out into parts. Motherboard disappeared and the case got worn out. Real shame, I remember it being a nippy machine, but I needed my 1.3(? )GHz Duron at the time. Doh! Time for a bit of an update. After study, holidays and some crazy work weeks, today I finally had time to get back to this machine. Done. Came off remarkably easy, and a little bit of white spirit did wonders in removing the glue too, followed by a wipe with meths to remove the white spirit. It turned out to be the button as expected. I was worried that as the button was in a custom bracket, it would require quite a bit of hacking to replace. 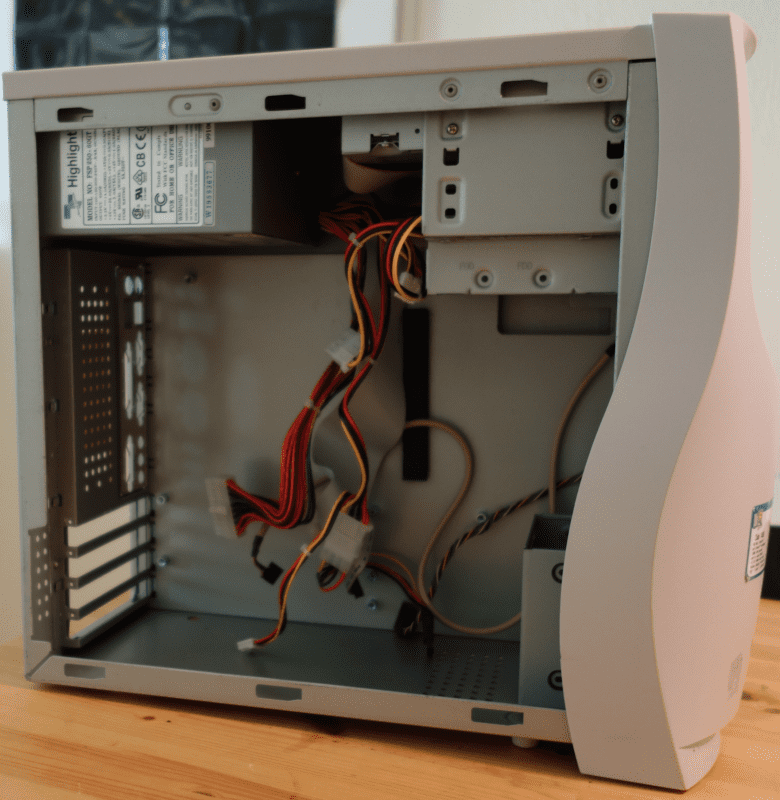 Turned out dead easy: the bracket is unique to this case, but the actual button and LEDs are exactly the same as with other period Packard Bell cases, and were only clicked into place. So I took a spare PB Spheris bracket I had, removed button and LEDs and inserted into this Squarius bracket. Fit perfectly, worked first time. Took a bit longer than a week to get the card, but it's in. And no, no noticeable difference as expected. Does mean I can use the old SATA-150 TX2Plus in another system, which is good as I have a few 8GB SATA SSDs looking for a home. Done, but not very happy with it. Main issue is that the PATA cable is much too long for this case. Also still messing around with converter & bracket for the SSD. This one stays on the list. I recently found a period-correct piece of obscure hardware, a Castlewood Orb 2 drive. It looks sort of out of place, but is unusual enough for this build, so inserted id. Still keeping an eye out for an LS-120 drive though. If internal temps are too high, I might add an outtake fan and/or put a hole in the side cover above the 120mm fan, so it can draw in cool outside air. Internal temps are very low, not seen anything over 40C even on the hottest days. Absolutely no need for this. Also upgraded the 3Com 100Mb NIC to an Intel 1GbE NIC. - Sort out those cables properly. - If I find a second (i.e. spare) case, get creative with it. One idea is to carefully remove the red/blue PB logo, replace with clear plastic and illuminate with red/blue LEDs. Update, some good, but unfortunately no good ending. Worst bit is that I missed an opportunity to nab another (working) 6168 last week as I already had a fully working system. dionb wrote: Update, some good, but unfortunately no good ending. Unfortunately neither the experience nor the station itself (it's on my wish-list though). Also no dead cards with similar SGRAM. Just tested with the other (non-CuMine) MS-6168 and the BIOS chip from the formerly good one - so software and firmware are identical. UT is still unstable, so that's software - but as feared no artifacts whatsoever. It's board-related. 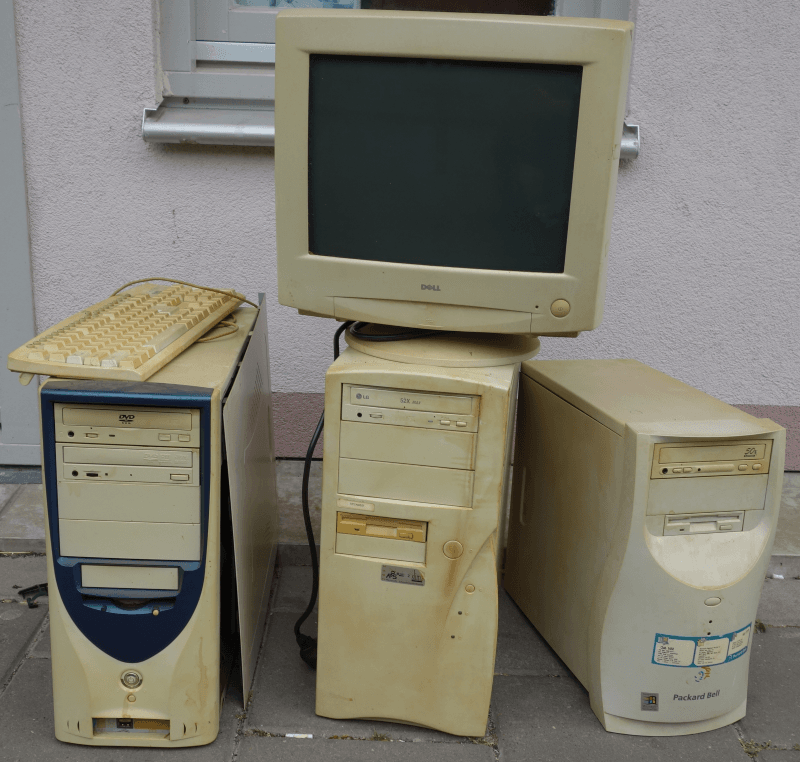 I have a thing for Packard Bell systems of any age. This is really cool. I like that case probably more than I should! Maybe you should have recapped the board completely in the first place, especially a MSI board. Btw, I like your system. I'm grown up with Packard Bells. Not the most elegant solution. I think that I have a period correct Packard Bell leaflet over here, I can upload it in this topic if you want to. I recall reading that these baords are picky. Im not exactly sure what you have to do to address the problem. But I do recall reading that certain drivers are buggy with them. Mr. horse wrote: I recall reading that these baords are picky. Im not exactly sure what you have to do to address the problem. But I do recall reading that certain drivers are buggy with them. Can confirm that. I had a MS6163VA and god, IBM hard disks weren't the brightest idea to use. It was also a Packard Bell OEM board, much to my surprise.